Who would have thought losing one hour for daylight savings time would totally screw up my entire week? I’ve been trying to play catch up all week and haven’t been very successful. I’m working to catch up over the weekend and with today’s rainy weather, it’s definitely helping. 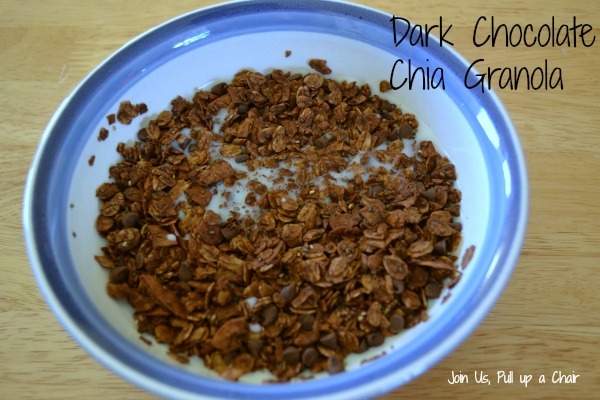 I’m always on the lookout for granola recipes and this one I found through one of the link parties I participate in. I saw dark chocolate and I was sold! I threw it together one night after dinner…it was so easy to make especially since I had all the ingredients on hand. It’s crunchy and I love the added health benefits of using chia seeds. I ate is a cereal one morning for breakfast and my daughter used it to top her vanilla greek yogurt. Regardless of how you like to eat granola, this is definitely one you want to try out! Mix together the oats, coconut, chia seeds and cocoa powder in a large bowl until well combined. In a small saucepan, melt the coconut oil and stir in the maple syrup and vanilla. Pour over the oat mixture and stir until everything is evenly coated. Spread the granola evenly on the prepared baking sheet. Bake for 45 minutes, stirring after 20 minutes to keep the granola from clumping together. Once baked, remove from the oven and place on a wire rack to completely cool. Once the granola is cooled, sprinkle on the chocolate chips and transfer to an airtight container. Enjoy!